Made in Switzerland by Felco. Reliable: comfortable, light, sturdy handles made of forged aluminium with a lifetime guarantee*. Blade and screw-mounted anvil blade made of high-quality hardened steel. Clean, precise cut. All parts can be replaced. Efficient: easy, durable cutting adjustment. Wire cutting notch and sap groove. Ergonomic: hand and wrist protection are provided by the ideal shape of the handles and the cushion-shock absorber. Non-slip coating. 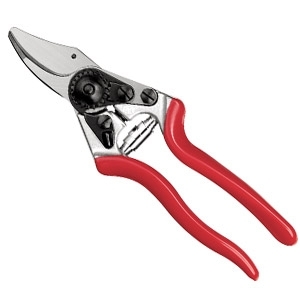 There is a FELCO pruning tool for every wine producer, landscape gardener and fruit grower. The "Green" range FELCO tools feature one-hand pruning shears, two-hand pruning shears, pull-stroke pruning saws, picking and trimming snips, grafting and pruning knives and is designed for both demanding professionals and amateurs.